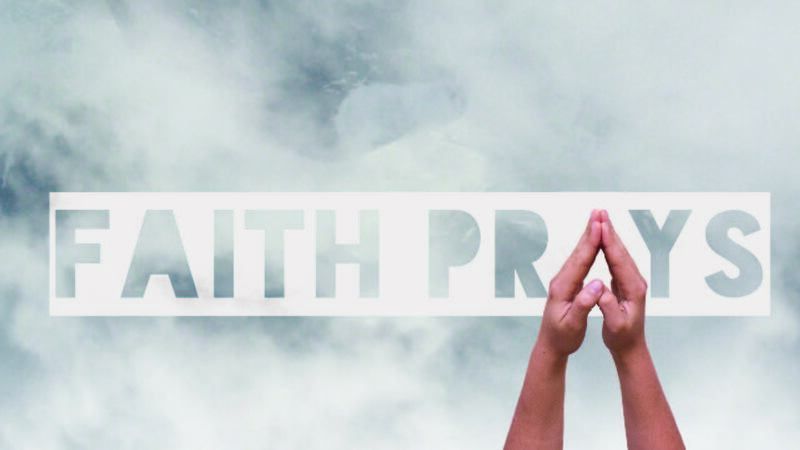 FAITH PRAYS When I first became a Christian I was 20, single, living at home and each night before bed I would talk to God for a while as I looked out my bedroom window over the lights of the neighbourhood. I think I got involved in prayer early in my walk with God simply because I was thankful that Jesus had saved me. Soon I prayed more because I began to imagine talking to people about Jesus and what I would say and what I imagined they might say in response. It was imagining how I might preach to an individual or a small group of people. From this scenario I would pray and talk to God about my day and my world and it wasn’t hard to let 30 minutes or even an hour slip by. Question: What motivates you to pray and talk to God? Prayer is a product of relationship. Maybe for some it begins with need. You may feel helpless and so you reach out to God for help and you begin to talk to Him. However, what truly motivates us is love, we pray because we love Jesus. When you have faith, you pray! When you have faith you know and understand the realities of your spiritual life. You fully understand that you were lost and now you are heaven bound. The realisation of that causes you to feel the great sense of gratitude for Jesus and what He has done for you. Faith enables you to know and trust that God loves you and wants to heal you and provide for you. Faith is the belief that God exists and that He is a rewarder of those who diligently seek Him. (Heb 11:6) So prayer begins with praise and thanks. It flows into asking and believing for those things you need God to do for you. It deepens with meditating on God’s word and seeking His presence and power. It closes with thanks and commitment, yet it never truly closes because our whole day can be filled with prayer. When the disciples asked Jesus to show them how to pray He responded with what we call the Lord’s Prayer, which is really the disciple’s prayer. Matt 6:9-13. You see and understand that your life is so small compared to the world and the Kingdom and yet being linked up to God makes you a key player in the purposes and plans of God that He has ordained. When Peter James and John left their nets to follow Jesus, they left behind a small world of fishing and selling their catch to a whole new world of impacting the entire planet with God’s plan of love and the preaching of the gospel. Today 2000 years later we are still talking about them and learning life lessons from them through the scriptures. Luke 5:1-10 David was an amazing pray-er. As we read the Psalms we see a man of relationship, a man who talked much to God and thankfully he wrote many of his prayers down as the Psalms. Psalm 27:8 You have said, Seek My face [inquire for and require My presence as your vital need]. My heart says to You, Your face (Your presence), Lord, will I seek, inquire for, and require [of necessity and on the authority of Your Word]. (AMP) Perhaps you feel your vital need is something to eat or the next episode of your favourite mini-series, but your vital need is what you have been mediating on – what you have been thinking a lot about. If you have not felt a desire to pray, then simply take some time to think. There’s plenty of time if you decide to turn off screens. Think deeply, it’s called reflective thinking, about what Jesus has done for you. Imagine sitting down with Him sitting opposite you and thinking about what you might say to Him and what He might say back. Question. Estimate the average time each day that you watching a screen, other than for work. Faith Prays. There’s the natural dimension of your life. And there’s the spiritual dimension. The spiritual dimension is by far the largest. It’s the part of your life focussed on eternity. You can focus on the natural world 100%, but the natural world is influenced by the spiritual world. You can live a bigger life when you focus on the spiritual world all around you. You can live with God, work with Him and see changes take place in the natural world because you apply faith. Will you decide you’re going to live a bigger life? Will you switch of the screens sometimes and just interact with God, give Him your undivided attention? Make prayer a vital part of your day and your life. CHECK OUT THIS ARTICLE ABOUT SCREEN TIME… http://www.mychristiandaily.com/index.php/fp-left-menu/14250-jesus-vs-netflix DISCUSSION QUESTIONS 1. Is prayer a vital part of a Christian’s life? 2. How much time do Christians pray nowadays compared to say bible times in the new testament? 3. Estimate the amount of screen time each day apart for work related. 4. Is there value in limiting screen time so that you can focus on prayer? 5. What would you like to pray about today? …AND LOVING IT! – THIS MESSAGE IS TO ASSIST YOU TO BE INSPIRED TO PRAY AND TO ENJOY IT. In a practical sense, prayer is talking to God, but of course it’s so much more than that. Prayer is an indicator of your relationship with God. Little prayer, little relationship; deep prayer, deep relationship. The foundation of how we all live our lives as Christians is given by Jesus at the Sermon on the Mount. Matt 6:33 But seek first his kingdom and his righteousness, and all these things will be given to you as well. (NLT) Seeking His kingdom first must begin by meeting with God in prayer and listening. When asked how much time he spent in prayer, George Muller’s reply was, “Hours every day. But I live in the spirit of prayer. I pray as I walk and when I lie down and when I arise. And the answers are always coming.” Source Unknown. INTERACTION: ASK YOUR PARTNER – DO YOU EVER FEEL INSPIRED TO PRAY? ONE MINUTE EACH, THEN BACK TO THE MESSAGE. Using the “Lord’s Prayer” as a guide to pray is helpful. Picture Calvary and thank God that you can call Him “Father” by virtue of the blood of Jesus. Praise God for Who He is and for what He has done for us. Hallow the names of God corresponding to the ­positive benefi­ts in the new covenant. Yourself and your family (mate, children, other family members). Your church (pastor, leadership, faithfulness of people, harvest of souls). Your nation (city, state and national political and spiritual leaders, harvest of souls). Pray for the peace of Jerusalem (Ps. 122:6). Be in the will of God (prayer life, church, work habits, obedience in giving). Believe it is God’s will to prosper you. Forgive and release others – set your will to forgive those who sin against you. Pray a hedge of protection around yourself and your family. Make faith declarations, be bold in faith – God hears and answers prayer ( John 5:14-15). It’s essential that every Christian has access to the word of God. Man shall not live by bread alone but by every word that proceeds from the mouth of God. – Matt 4:4. Almost any verse can turn into a prayer. Let’s go to the psalms and I will show you how to pray read the bible. Now pray the words like this…. 1 Thank you Jesus that you are my Shepherd you feed me, you guide me, and you shield me], I shall not lack. 2 Lord you make me lie down in [fresh, tender] green pastures; you lead me beside the still and restful waters. 3 Lord you refresh and restore my life (my self); You lead me in the paths of righteousness [uprightness and right standing with Him—not for my earning it, but] for His name’s sake. 4 Yes Lord Jesus, though I walk through the [deep, sunless] valley of the shadow of death, I will fear or dread no evil, for You are with me; Your rod [to protect] and Your staff [to guide], they comfort me. Could be prayed like this.. In your love God you chose me [actually picked me out for Himself as your own] in Christ before the foundation of the world, through Jesus now I am becoming holy (consecrated and set apart for Him) and blameless in His sight, even above reproach, before Him in love. INTERACTION: ASK YOUR PARTNER – WHAT WOULD HELP YOU TO BE MORE FOCUSSED TO READ THE BIBLE AND PRAY? ONE MINUTE EACH, THEN BACK TO THE MESSAGE. S- Scripture – Write out in full one or a few verses. O – Observation – What is this verse or passage saying to you? What is the main point of the scripture? A – Application – How can I apply that verse and the truth of that verse to my life? P – Prayer – Write out a prayer hat you now pray to ask God to help you apply that verse to your life. Get hold of some great Christian music and listen and sing along and love Jesus with all your heart. One of the most important prayers you will ever pray is, “Lord Jesus, forgive my sins and come into my life. I believe you died for me and I believe you rose again from the dead for me.” If you have never prayed that prayer before, will you pray it right now? IF YOU LOVE, YOU PRAY. Have you ever felt powerless? Have you ever felt like you desperately wanted to change the unchangeable? Have you longed for a friend or loved one to come to Christ but your sharing of faith falls on deaf ears? Then you need to learn to pray and become confident in prayer. Talk about saved from the fire! My great uncle was so anti Jesus that he told me when I got saved, “Don’t ever mention that name in my house ever.” But my great aunt got saved watching the TV program that our church ran in the late 70’s. Then one day my great uncle had a stroke. He went to hospital and was in a bad way with one side of his body paralysed. I went to see him and all the family came. He was about 76. Two days later his wife dies in her sleep. Wow, if my great uncle finds out that she’s gone he has nothing to live for, surely he will breath his last. I prayed. All the family left me alone as I told him. He was very visibly shaken. I told him if you ever want to see you darling wife again the only way is to ask Jesus to forgive you and save you, if that’s what you want then squeeze my hand. He did! I prayed a prayer with him and ten hours later he died and went to glory. That’s cutting a bit fine! I prayed a desperate prayer because LOVE PRAYS. When my kids were very small, they would get sick with things like tonsillitis and some nights Chris and I would be up for hours as they cried and were very distressed. They wouldn’t go to sleep so we took turns and paced the floor with them in our arms and we prayed. Were we tired? – yes! Did we want to go to bed? – Yes. But LOVE PRAYS. As a youth leader in Brisbane one of my larrikin youth contracted a melanoma cancer and he had a brain tumour. He had an operation but another tumour grew back. He was desperately ill and I stayed up all night at the hospital praying for him in his final hours. He literally died in my arms. I didn’t enjoy being there, I didn’t see the victory I wanted, I didn’t see his mates there, it was just his mum and dad and me. I prayed because LOVE PRAYS. We went through some really tough days in the Brisbane church. At the time I was the Assistant pastor and the senior pastor fell into adultery. I began to pray in earnest for the church and for the sheep. I could see the great damage that could be caused and how the devil could have a field day with this situation. It even went to the newspapers. At the time I rose early to pray for the church and God showed me a picture of a great tower similar to the high voltage power line towers that had been broken down. It represented the church and as I prayed over the next three years I watched it grow back up to its former strength. Jesus loves His church and I love what He loves so I prayed. I prayed for a long time because LOVE PRAYS. At one point the church in Brisbane was deeply struggling, I was deeply struggling too and I knew that working with the staff of the church would be so much easier and more effective if a couple who had been posted overseas to New Zealand could come back to the Brisbane staff. It was impossible as they were senior pastors of a church in Auckland. But I stood on the beach at the Sunshine Coast one night and looked over to the far distant land of New Zealand over the horizon and I prayed a prayer of desperation. I shouted to God, “Send this couple back to help me.” Two months later they were back on staff in Brisbane. I loved the church and wanted to see it flourish and grow. I prayed because LOVE PRAYS. When I came back from Thailand this year on June 16 I felt God calling me to separate myself to pray for the city. I have felt His call to do this for a long time, but finally I obeyed and since June 16 I have been in this church at 5am each week day to pray for two hours. I love the lost people of this city so I pray for the people of this city. I pray because LOVE PRAYS. Jesus Prayed for the church, for us. John 17: 9,20,21. 9 I am praying for them. I am not praying (requesting) for the world, but for those You have given Me, for they belong to You. In Ephes 5:25 it tells us husbands love your wife as Christ loved the church. Jesus prayed for the church because LOVE PRAYS. LOVE wants the best, wants the answer, wants to see breakthrough. However we realise that we can’t do anything in our own strength, so we pray because prayer releases God’s strength and power. Prayer connects you to eternity. Prayer connects you to impossibilities. Prayer connects you to the divine. Prayer makes the impossible possible. Prayer is unavoidable if you’re hoping for more. Prayer is like breathing to a Healthy believer. Prayer lets you live in the future of hopes fulfilled. Prayer sets you down beside God and makes you part of His team. Prayer is lifeline to all your resources. Prayer is a conversation with eternity. Prayer opens your heart to God, your eyes to the spirit and your ears to hear his voice. Prayer is more than words. http://youtu.be/bsHH0HYgmSs Also see Matt 26:36-45. In His moment of agony, He cried out to His disciples, will you not watch with me one hour? So great the need; yet so lacking the response. It did change later when these men were filled with the Holy Spirit! At Jesus moment of terror He needed someone to stand with him and intercede. He needed the support of men who were with Him in the battle, but perhaps God ordained that He faced all that alone, so that He could carry your lack of support and offer you the answer that you are never alone because he was alone for you. It’s our turn now. If we love the ones God has given us, we will pray. If we love the people of this city, we will pray. If we care for our nation, we will pray. Pray for your lost friends and relatives in your own time. Make a record of your prayer times in the Prayer Tally website. Find a friend and pray together. Pray at early morning prayer times at Kid Town Room 6-7am weekdays. Plan to be at the prayer storm event August 30 7-9pm. Learn to pray by praying with others, reading books, listening to the podcasts. 1. List the things/people you love in descending order – Do you pray most for he ones you love most? 2. Do you find that you pray most when things are not as they should be – when there’s trouble? 3. Do you have a confidence that God hears you when you pray? 4. Consider deeply the lost people around you. Do you love them? 5. Will you pray for God’s mercy to be extended toward them and draw them to the Father?